This entry was posted in Conference Update, JCYLC Meetups and tagged #2017JCYLC on October 10, 2017 by JCYoungLeaders. Keen to attend the 2017 JCYLC, but can’t afford the high cost of travelling across our vast country?! The NAJC Young Leaders Committee can help alleviate the cost of transportation, accommodations and registration for this year’s JCYLC! Apply ASAP for a subsidy! Click HERE to apply for a subsidy. This entry was posted in Conference Update, Funding, JCYLC Meetups on August 15, 2017 by JCYoungLeaders. This year’s intake is now closed! 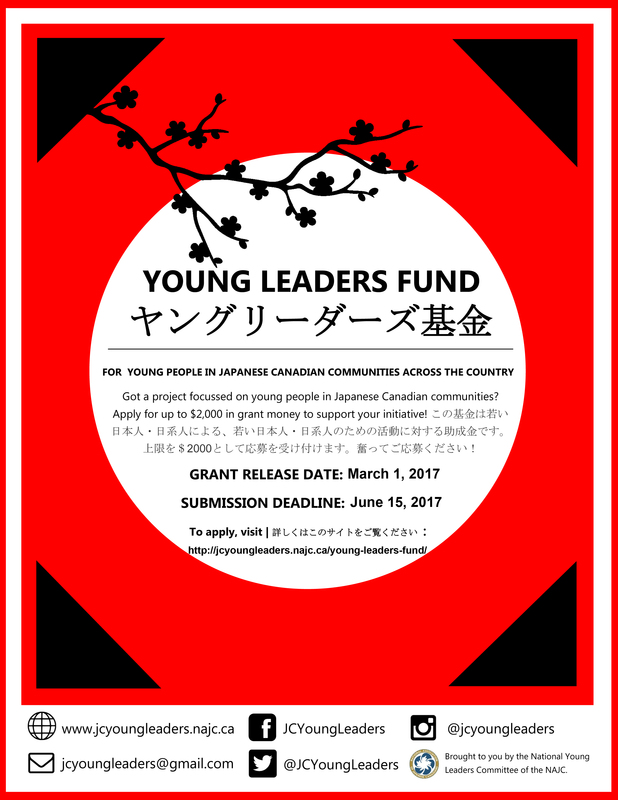 Check back next year for more funding opportunities for Japanese Canadian youth. This entry was posted in Funding and tagged Young Leaders Fund on June 20, 2017 by JCYoungLeaders. REMINDER THAT WE’RE STILL ACCEPTING APPLICATIONS FOR THIS YEAR’S YOUNG LEADERS FUND! Are you between the ages of 13 and 39? Do you have an engaging idea or initiative in mind that aims to have a positive impact on young people in your local Japanese Canadian community? The Young Leaders Committee is excited to open applications for this year’s Young Leaders Fund. Apply now for up to $2000 in grant money to support your project! You can find more details and the application forms here. This entry was posted in Funding and tagged Funding Opportunity on May 14, 2017 by JCYoungLeaders. Sponsor a Young Leader to attend the 2017 JCYLC! Every year since 2012, Young Leaders from across Canada have traveled to NAJC Conferences or NAJC Young Leaders Conferences (JCYLC) to learn and grow as young leaders in their respective Japanese Canadian communities. Help a Young Leader cover a portion of their travel expenses to attend this year’s conference in Ottawa/Gatineau. You will receive a personal “thank you” message and photo signed by sponsored participants! The suggested donation is $400. Please contact JC Young Leaders for more details on how to donate. More details about sponsorship opportunities (e.g. $50 to treat a young leader to dinner, in-kind donations, etc.) available here: Sponsorship & Donations – Personal. This entry was posted in Conference Update on April 22, 2017 by JCYoungLeaders.